When you sign up for a Coviu paid account and invite team members, they are all added as normal members with restricted capabilities. For example, they cannot access the list of team members, can't see billing information, and can't configure the account. 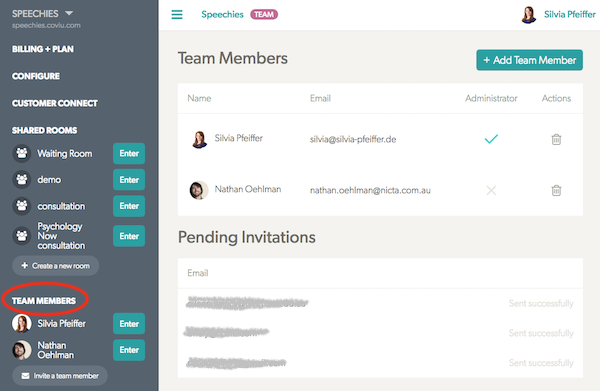 To manage team members, sign in and click on the "Team Members" text in the application menu. You can remove members that have left your team by clicking on the little rubbish bin symbol to the right of their name. This will reduce your monthly charges, so it's good to keep your member list up to date. The system will automatically amend the charges and you will get reimbursed for the days that the deleted persons are not signed up in the next month. Please make sure to keep one administrator around! and configure any add-ons, including the client portal, bookings etc.